Andrew Smith might just have the best job in the world. His job description: to have fun. His job requirements: to document and share it with the world in blog posts and across social media. Oh yeah, and he’s getting paid $100,000 for the six-month-long assignment. Right about now you’re probably asking yourself, as you prepare your resignation letter, “how do I get that job?” Well, it’s not that easy. Last year, the fine (and genius) folks over at Tourism Australia brought back the Best Job In The World contest after the massive international success of the contest in 2009, which awarded one lucky winner the title of Island Caretaker on the Great Barrier Reef. But this time around, seven positions were up for grabs: Park Ranger in Queensland, Outback Adventurer in the Northern Territory, Taste Maker in Western Australia, Lifestyle Photographer in Victoria, Wildlife Caretaker in South Australia, Tassie Devil Wrangler in Tasmania, and last but not least, Chief Funster in New South Wales. Sounds pretty good, right? Well 330,000 people from 196 countries thought so, applying for these seven, I repeat, seven jobs. To make a long story short, eliminations ensued, seven talented contestants were left standing, and 25-year-old Andrew Smith was named New South Wales Chief Funster. So you see, it wasn’t that easy (keep your day job for now). With his reign as Chief Funster now half way complete, I checked in with Andrew to get the the inside track on some of his favorite experiences so far and what he’s looking forward to. 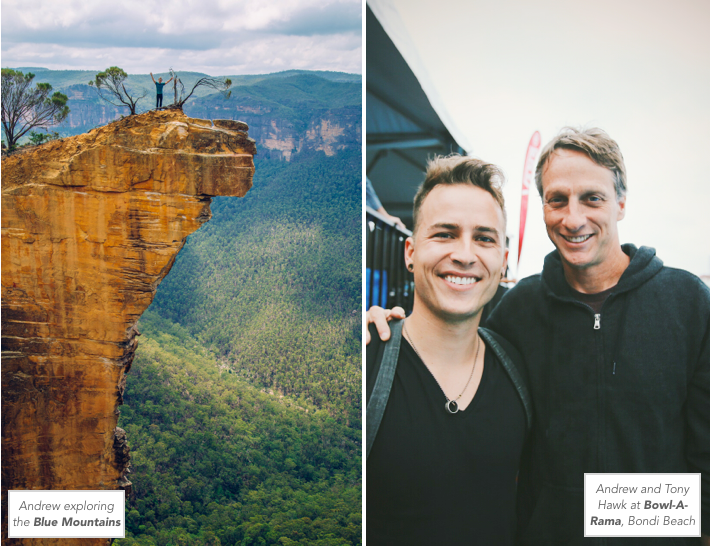 It’s Andrew’s job to uncover 802,000 moments of fun during his six-month stint (one for each square kilometer of New South Wales), so keep in mind that what’s listed here are just a few out of thousands. To follow all the fun, see the links at the bottom of the page. Trevor Morrow Travel: Let’s start with the basics. Where are you from? Andrew Smith: I’m from Orange County, California. TMT: Why do you travel? AS: There are 7.1 billion people on earth. When you put it into perspective like that, it isn’t feasible to expect to understand our world if you just stay in one spot. I believe travel is the only way to learn about humanity in a personal and meaningful way. Travel often changes you along the way, too. 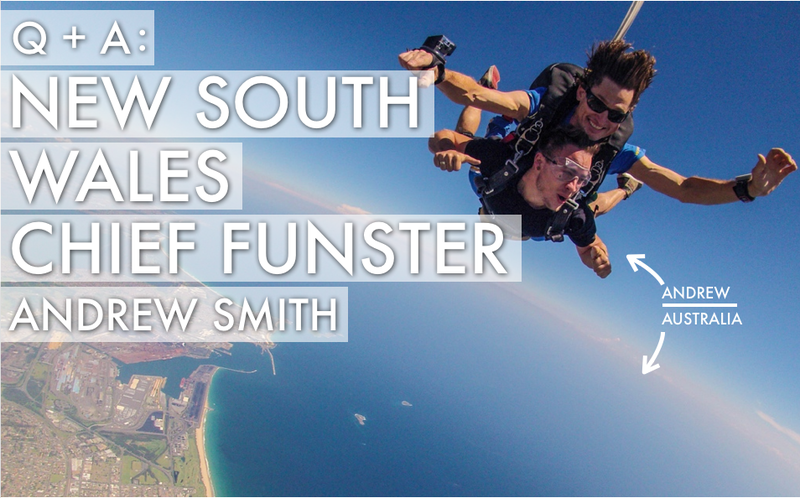 TMT: What did you do before you landed one of the best jobs in the world as the New South Wales Chief Funster? AS: I was a producer at the digital agency ENVOY in California, social media manager for the travel show Peeta Planet in Dubai, and social media consultant for a division of Harper Collins. TMT: What are the three places at the top of your “I want to go there” list? AS: Well, I worked like crazy to get myself here to Sydney. That definitely wouldn’t have happened if Sydney wasn’t a top priority of mine. Looking beyond, I’d probably have to say Japan, Belgium and Iceland, all for entirely different reasons. I went to Japan last year for a short trip and realized right away four days wasn’t going to cut it; Tokyo alone is so immense and complex. Because I’m a huge fan of craft beer, Belgium is high on my list. I’d love to tour all of the monasteries there as well. Finally, Iceland’s landscapes seem so mysterious and otherworldly. I’d love to go there some time with no itinerary, no plans, and just get lost. TMT: As much as I’m an advocate for traveling to far away places, I’m also a believer that you don’t always need to go far to travel. What’s the coolest place or most unique/fun experience you’ve had while traveling in America? AS: In a similar vein to NSW, California is huge and jammed with variety. It’s completely possible to do hundreds of different activities and see a vast number of different landscapes in the single state. I highly recommend San Diego County for the breweries, Salvation Mountain for the utter weirdness and desolation, and researching Los Angeles’ underground electro scene, if you’re into that sort of thing. TMT: Alright, now on to Australia and New South Wales. You’ve been tasked to uncover 802,000 moments of fun in six months while in New South Wales (one for every square kilometer in New South Wales). That’s a lot of moments to keep track of. Can you share a few of your favorite moments of fun you’ve had in New South Wales so far? 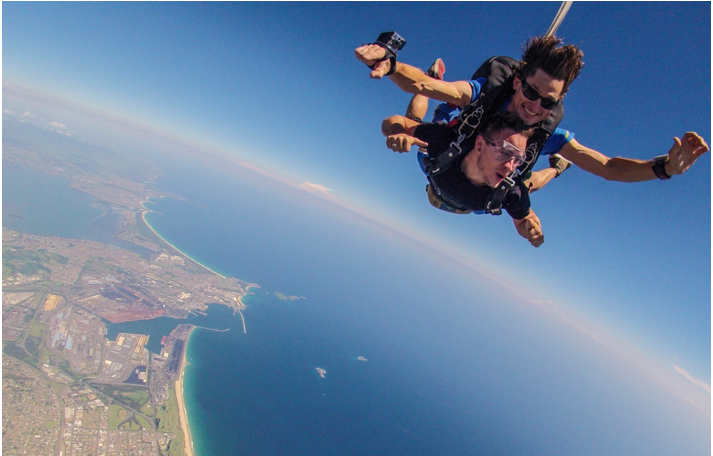 AS: Well let’s start with the obvious: skydiving over the beach in Wollongong, south of Sydney, was a sensory overload. The view on the way was so beautiful I actually forgot for a moment that I’d just jumped out of a plane from 15,000 feet. The crew at Skydive the Beach make it a breeze as well, no pun intended. 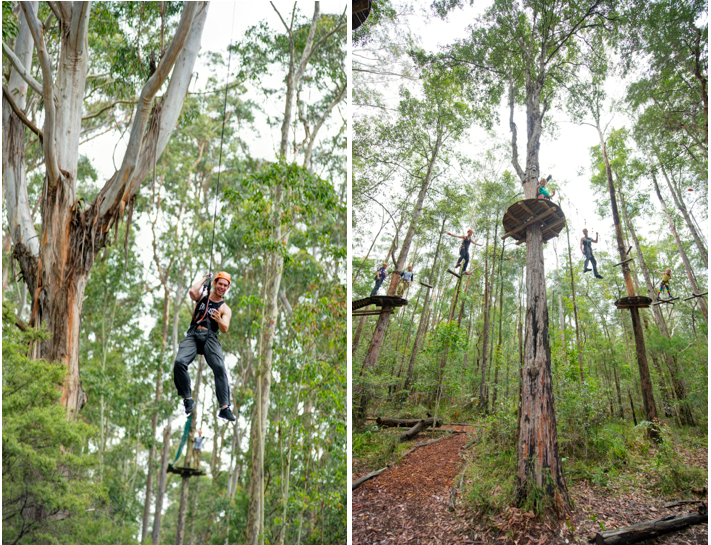 At a slightly lower altitude of 15 meters, TreeTops Adventure Park in the Central Coast north of Sydney was incredibly fun. An obstacle course embedded into nature and suspended over the ground presents itself as not only a challenge but an amazing adventure activity that I won’t be forgetting anytime soon. 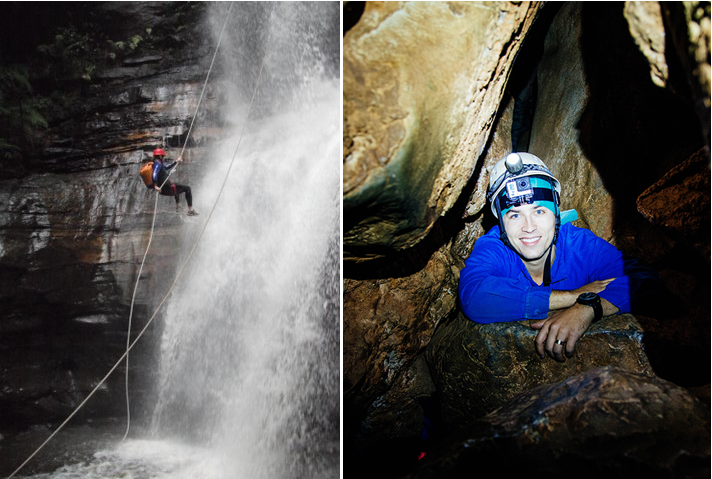 Canyoning through the Empress Falls in the Blue Mountains just outside Sydney was nothing short of spectacular. Nature truly feels like a playground on this trek as you are encouraged to fall into natural pools of water, feel the rocks beneath you and finally rappel 30 meters down a very active waterfall. It’s equal parts adventure and serenity. TMT: What’s on your agenda and what can we look forward to over the next few months? Any New South Wales festivals, concerts or events we should know about? AS: Vivid Sydney festival from 23 May to 9 June has all the hallmarks of what I’d say are some of my top interests: technology, music, design and entrepreneurship are the stars of the show. There’s a very high level of interactivity available to attendees as Sydney Harbour and surrounding precincts turn into a colourful playground of light, music and ideas. 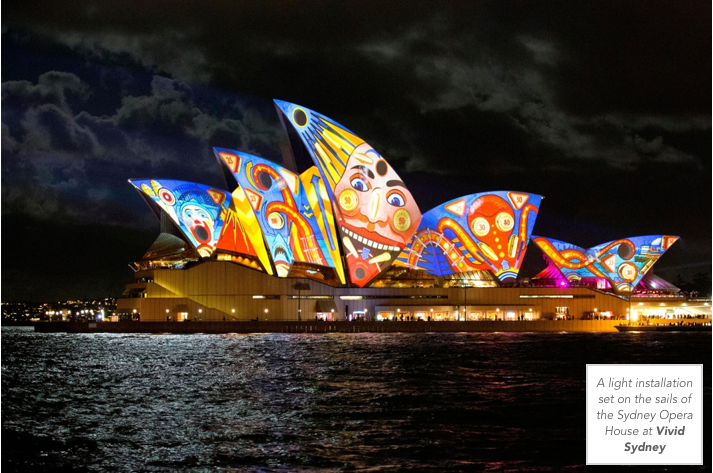 I’ve heard a real highlight is Lighting The Sails, where a massive artwork is projected onto the sails of the Sydney Opera House at 6:00pm each night for all to see. Australia is home to species of animals that can’t be found anywhere else in the world. Many can be found at Sydney’s Taronga Zoo, one of the most iconic zoos in the world, set along the harbor. 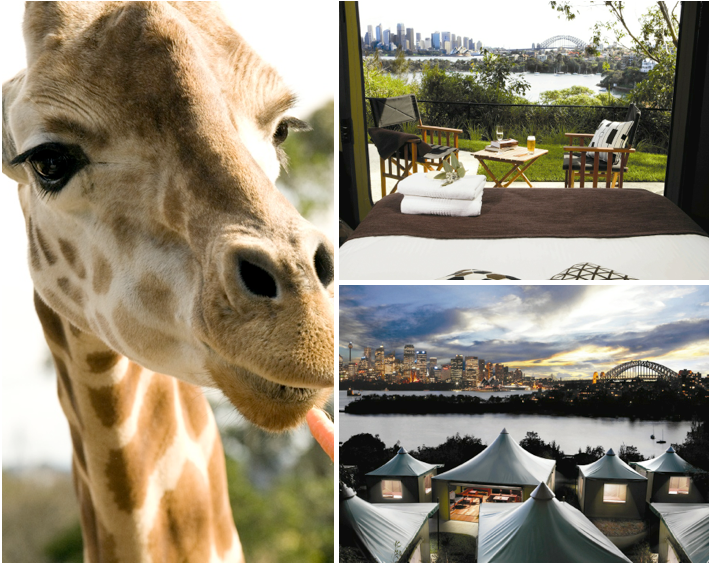 The thought of being able to stay in a place like that overnight, listening to the animals as you sleep is as unique as it sounds, and Taronga Zoo’s Roar ‘n’ Snore experience lets you do just that. I can’t wait to do it. 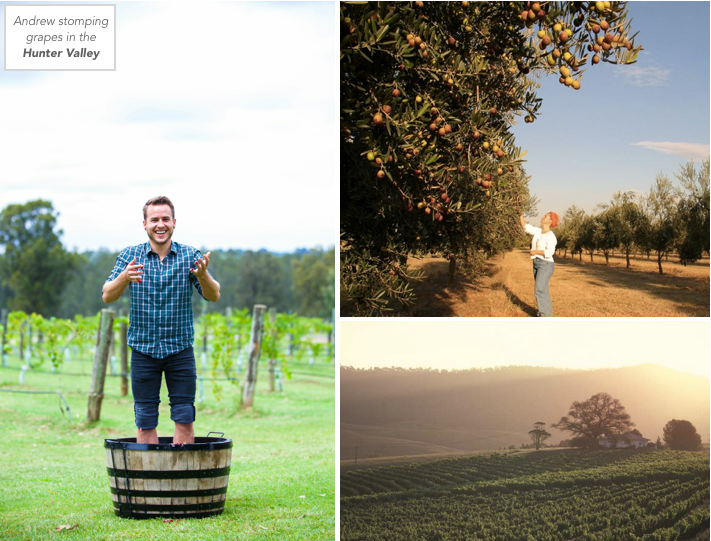 I’ve just been to NSW’s Hunter Valley – a region known for its incredibly fresh produce and excellent wine, but more than that, it offers a chance to see how these products come to be. The story is often the most fascinating part of what’s presented on a plate or in a glass, and meeting the passionate people behind the effort is always inspiring. I also stomped my own grapes… not sure if anyone will be drinking that vintage. The region is full of great events too (you can see them all here) but some to note are the Bitter and Twisted International Boutique Beer Festival held inside the walls of an ex-maximum security prison, Hunter Valley Wine and Food Month which runs throughout June, and The Gum Ball, a laid back weekend festival of music and art held on 100 acres of bushland. 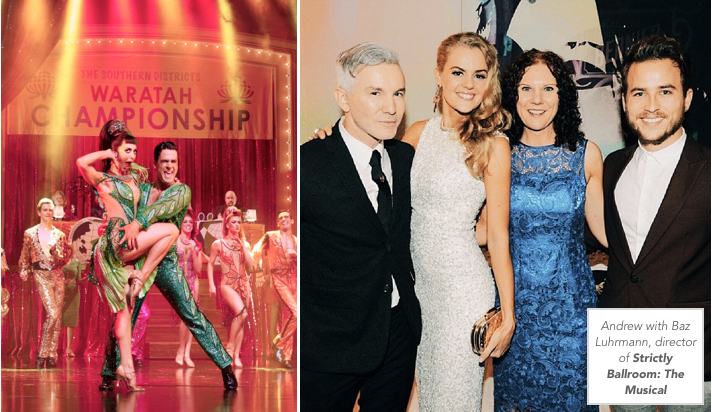 Everyone’s talking about the world premiere in Sydney of Strictly Ballroom: The Musical – a stage play devised by the original creative team behind the classic 1992 Australian film, including Baz Luhrmann as director and co-writer and his wife Catherine Martin – the most awarded Australian in Oscar history, with four coveted wins as a costumer producer. It’s playing through June 1st in Sydney, so don’t miss it! Finally, to completely peg myself into a predictable corner, I’m amped for the 2014 Sydney Craft Beer & Cider Fair on 14 June. With more than 30 different breweries attending, we’re looking at 150 different beers and ciders on offer at a single time. Imagine a ton of nerds at a Star Trek convention, but replace all of the Klingons with master brewers and space with beer. Yup. TMT: Have you picked up any good Aussie slang? If so, give us a few examples and their translations. AS: Just replace “I think” with “I reckon” and you’re halfway there. You’d be “fully sick” if you were eating some Vegemite on toast while driving a Holden though. Give it a “burl”, mate (means “have a try”). TMT: I know you still have a few months ahead of you on the job (through June 2014), but do you have any thoughts on what’s next for you after your reign as New South Wales Chief Funster comes to an end? Any plans to stay in Australia? AS: The quality of life here is really high – the cities are clean, nice and full of great people; there are jobs available and compensation outperforms a lot of other options across the world. So, chances of me sticking around are pretty high. It’s been a great chance for me to meet new people and grow a local network. It’s pretty easy to get a Working Holiday Visa and I’ll have another six months remaining on mine, so the rest is yet to be seen. To be honest, I’ve been having so much fun getting out there and telling the story of NSW that the question around “what’s next?” is only just starting to cross my mind. For information on tours throughout Australia, click here: visit Australia.